After a High, there is always a downer. It happened in the Bible stories and it happens in our own. A few kilometers back down the dusty Everest road and after a brief visit to the Rongbuk Nunnery monastery (nuns live below the road, the monks above????) the guide said we are taking a short cut which will get us back to the paved road and the hamlet (chong-tso in Tibet) of Old Tingri. I thought it was a hop, skip and a jump with a bunch of bounces. But let me tell you, Tibet is one huge barren place. It's like the Sahara. Huge and endless and not one thing green. 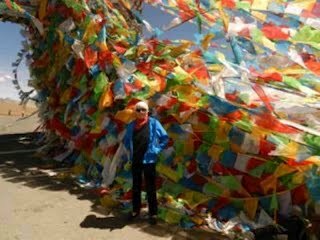 The Himalaya creates the rain shadow over the Tibetan plateau causing it to be a high altitude desert. There's another in Atacama in Chile, which I visited. 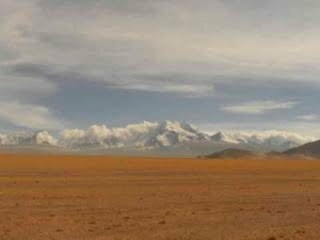 And it's similar to the rain shadow caused by the Sierra Nevada of California to give us Death Valley, But in Tibet there is an average elevation of 14000 feet, which is higher than any mountain in the continental USA. 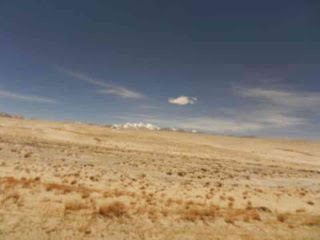 So Tibet is high, dry and cold. Of course the light here clearly identifies every fold, crack, gully, and rock. I didn't know there were so many shades of beige, brown, yellow and of course the sapphire blue sky which goes on forever. 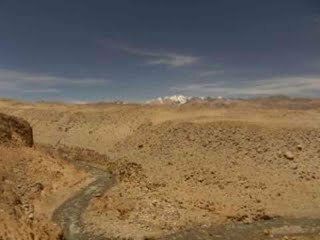 When the Indian continental plate scrunched up against the Asian continental plate to form the Himalaya and Tibetan plateaus way back when, hundreds of millions of years ago, these odd shaped mountains and rocks formed. Still, with no wear and tear or "civilization", it's amazing landscape - huge huge valleys where the melt off from Everest snow - known for its milky color even thought it is fresh and pure - requires a number of primitive metal bridges for any kind of vehicle, wagon, or foot needing to get to the other side. Please believe me for three rough, tumble, excruciating hours in hot hot sun and dust surrounding us like halos, there was not one other vehicle. Not one. I kept thinking what happens if...... You can fill it in. It's called, "you wait." I'm not a decent waiter, much less a longterm car rider in horrid circumstances. I sip on my water and cross and uncross legs, and one time we had to stop at a destroyed rock pen, where someone somewhere at sometime corralled sheep in at night, so I could release the water I was sipping. Alas. I remember the old days out west (I'm talking 40ties and 50ties) when it was the only answer, and in East Africa where I lived 2 years in Tanganyika and we did simple safaris. And of course on the trek through the Khumbu in Nepal four years ago. It's something to have to deal with big time when you trek. And now for 9 days, there will be no plumbing. Yes. My mind is not accepting this happily. So we drove and we drove down mountains, across buttes, and the dust got dustier and I wondered if anyone would find me if lost - I had worn my florescent blue workout shirt with the reflectors - just so He wouldn't lose sight of me. He could out here. I yelled up some desperate prayers while the guide in the front seat continues his "ommms" which I guess take the place of radio music. Then we finally got near lunch,(it was 4 pm.) we picked up the Friendship Highway again for about an hour - and I got in some needlepoint, which settles my nerves, short lived as it was. I had been forewarned at lunch there was more dirt road to come. So we ate vegetarian momos and more french fries and I found packages of tiny Chinese Oreo version of the original cookie. 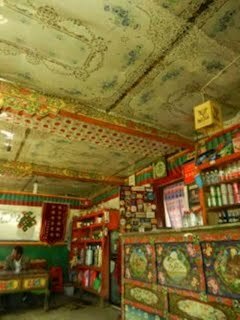 These rest stops are painted wildly inside with Tibetan Buddhist images. Tables seat four and there is a long bench against each wall - all covered in thick carpets for comfort. Most menus feature momos (Chinese dumplings), yak things, Chinese vegetables, tofu noodles, rice, rice, rice and NO deserts nor bread. All is made from scratch after we arrive so you get forced delay/rest/meditating. As we entered two scraggly, hair clump shedding dogs barred the way, and did not blink as we stepped over them, getting their Vitamin D in the hot afternoon sun. All dogs are hairy, of a sort. 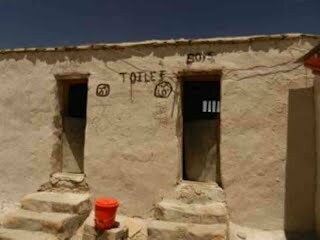 We had 70 kilometers of pure dirt road to Saga, our night haven - last chance at electricity and indoor plumbing. The wind is disturbingly strong whipping around us as the driver climbs dust mountains to cross passes - so much so we are eating our own dust most of the time and I have a penchant for keeping the windows open for fresh air. You should have seen me three and a half hours later when we reached Saga. I'm at my wits end and eat the package (small) of Oreos instead of opting for dinner in my dust guise. You need to know there are very few places to live or survive here - herding sheep and yak and some semblance of farming - barley, wheat, peas - exists but not much else. 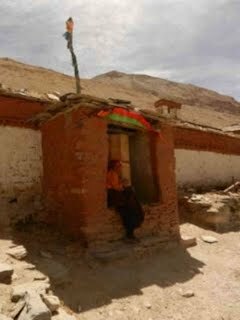 Every house in Tibet outside the city is the identical - the brick squared in patio style, two stories, simple simple (not painted) with window shutters colorfully decorated with Tibetan images - usually tigers, snow lions, deer. There are no truck stop type places to fill up, get a snack and move on. Even I who loathe fast foods and food in packages or boxes, longed for a fried pie or some pita chips, or, ok, Snickers. (Today we purchased a box of Snickers bars in the last chance at a "super" market as we prepared for the part of the trip starting today where we cook our own - and that's mostly noodles.) When I did Everest before, Snickers and Sprite kept me alive. We have another full day of driving - on PAVED roads thanks be to God. It's 500 Kilometers which will take us til dusk. The roads are paved but 40 to 50 miles an hour is about all our driver dares. If we were in USA, I'd hit the 75 button. Yes, We are a crusade of two lonely land cruisers. But soon we will confront the masses of Indian pilgrims who flow over the borders from a different side to walk the Kora (holy circumambulation) of Mt. Kailash at this sacred time of the year. Maybe someone will offer me a bowl of curry? 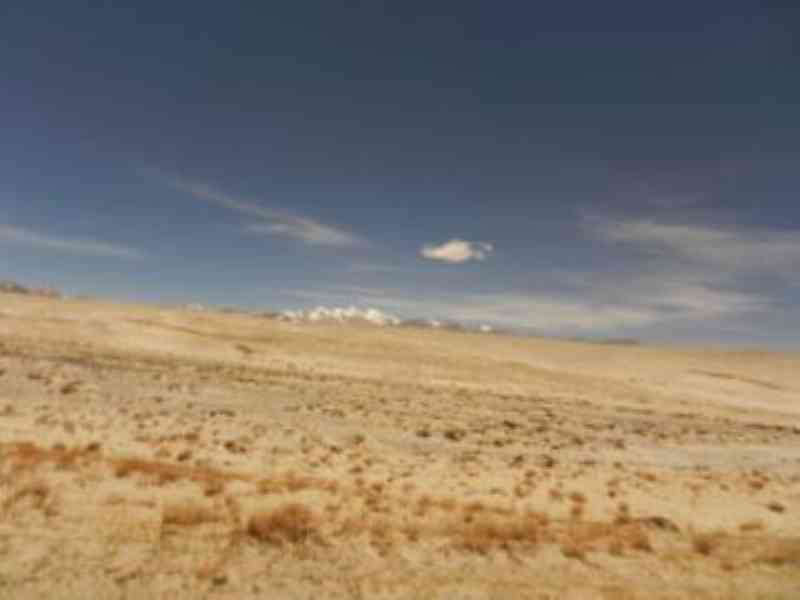 Our destination is Lake Manasarovar, which is the holy lake that fronts Mt. Kailash. It's holy because it's the base of Mt. Kailash. That's what they tell me. It represents the female or wisdom aspect of enlightenment and is a symbol of good fortune and fertility. If one bathes in it, all sins are cleansed. Now that's a direct parallel to our Christian baptisms in or with holy water when all sins one inherits and commits are cleansed. This I like. I think the task here is to leap into water minus 7 Celsius. Blogs will be erratic for the next week. Tomorrow I may be able to send one - we have a device to charge the laptop in the car. And we will use our satellite, I hope. We cannot carry electronics on the Kora so from Friday on no contact for three nights. Bear with me. Keep us in prayer. God bless.